Heat oven to 400°F. 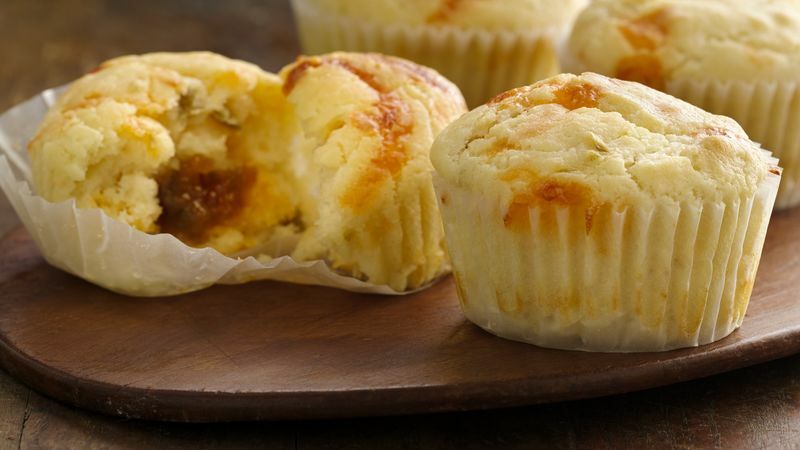 Place paper baking cups in each of 12 regular-size muffin cups. Spray lightly with Crisco® Original No-Stick Cooking Spray. In large bowl, beat buttermilk and egg with wire whisk. Beat in oil until well blended. Add flour; stir until moistened. Fold in cheese and 3 teaspoons of the jalapeños until blended. In small bowl, mix preserves and remaining 2 teaspoons jalapeños. Spoon about 2 tablespoons batter in each cup. Place 1 teaspoon preserves mixture in center of each. Top evenly with remaining batter. Bake 23 to 26 minutes or until golden brown. Cool in pan 5 minutes; remove to cooling rack. Cool 10 minutes. Serve warm.